The space shuttle Discovery sits poised for an Aug. 25, 2009 launch atop Launch Pad 39A at NASA's Kennedy Space Center in Florida to begin the STS-128 mission to the International Space Station. 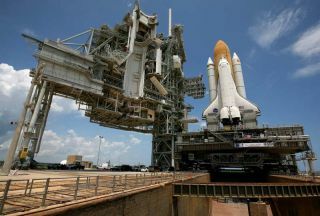 The weatherlooks promising for NASA?s planned predawn Tuesday launch of the space shuttleDiscovery and seven astronauts bound for the International Space Station. NASA testdirector Steve Payne said Discovery currently has a 70 percent chance of good weather for launchingspaceward Tuesday at 1:36 a.m. EDT (0536 GMT) and lighting up the dark morning sky over the Kennedy SpaceCenter in Florida. ?It shouldbe a spectacularlaunch,? Payne said today in a mission briefing at the spaceport in CapeCanaveral, Fla. ?I?m hoping we put on a good show for you.? Of theseven remaining shuttle missions before NASA retires is shuttle fleet in 2010or 2011, Discovery?s is currently the last planned night launch, thoughschedules can change, Payne added. The onlyissue for the upcoming launch is ongoing analysis of a shuttle power controllerthat had to be replaced on Discovery, but Payne said engineers are confidentthey will complete the work in time for liftoff. NASA willbegin counting down toward the Tuesday launch tonight at 11 p.m. EDT(0300 Aug. 22 GMT). Discoveryis poised to fly a13-day mission to the International Space Station to deliver about 15,200pounds (6,894 kg) of new science gear, supplies and spare parts for theorbiting laboratory. Three spacewalks are planned for maintenance work,including replacing a massive ammonia cooling system tank that weighs as muchas a small car. Theastronauts are also delivering a new treadmill named after comedianStephen Colbert, who tried to have a new station module named after himearlier this year, but ended up with the exercise gear instead. VeteranNASA astronaut Rick Sturckow will command Discovery?s flight. He leads asix-man, one-woman crew that includes first-time flyer Nicole Stott. Stott isflying to the space station to replace fellow NASA astronaut Tim Kopra as amember of the station?s six-personcrew. Kopraarrived last month on the shuttle Endeavour and will return home with Discovery?screw. Stott is slated to return to Earth in November on the next shuttleflight. NASA hasuntil Aug. 30 to launch Discovery?s STS-128 mission before standing down untilOct. 17 to avoid space traffic conflicts at the station with Russian spacecraftand Japan?s first unmanned cargo ship. That Japanese spacecraft, the H-2 TransferVehicle, is due to launch Sept. 10. A Russiancargo ship is scheduled to leave the station mid-September and a Soyuzspacecraft is set to launch toward the station on Sept. 30. Payne saidDiscovery has four chances to lift off during its five-day launch widow, withfair weather expected.